Bolka (Matus Kobolka) is known as the hot guy who is into glitchy microtonal compositions and whose cap has a very wide fanbase. His work is strongly connected to glitch culture, as well as to academic electroacoustic music. 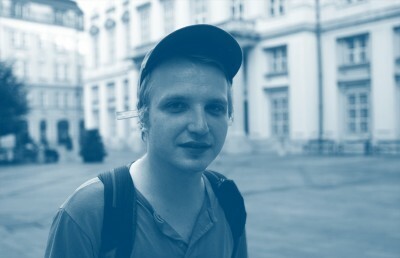 He is a composer, performer and open-source enthusiast based in Bratislava. Bolka’s practice has shifted from free-improvised electronic music to more rigorous tactics embracing comedy, “genre-bending”, and repurposing popular music techniques. He aims for estranging computer music along with the ways of performing it live, which often leads to explicit abuse of technology and playful sonic outcome. He uses a custom-made software written in SuperCollider programming environment in combination with naïve hardware solutions.